Production designer Sarah Greenwood earned Oscar nominations this year for both "Darkest Hour" and "Beauty and the Beast." Emilie Georges was a producer on "Call Me by Your Name"
Along The Road To Oscar is a significant destination in and of itself—the DGA Awards. And four of this year’s five DGA nominees for Outstanding Achievement in Feature Film correspond with those in the running for the Best Director Oscar: Guillermo del Toro for The Shape of Water (Fox Searchlight); Greta Gerwig for Lady Bird (A24); Christoper Nolan for Dunkirk (Warner Bros.); and Jordan Peele for Get Out (Universal Pictures). SHOOT was on hand for the Directors Guild’s Meet the Feature Nominees symposium earlier this month (Saturday, 2/2) at the DGA Theater in Los Angeles where dual Oscar/DGA nominees del Toro, Gerwig, Nolan and Peele shared insights into their films. The session was moderated by director Jeremy Kagan. Later that same evening, at a gala ceremony in Beverly Hills, del Toro won the DGA Award, making him the odds-on favorite to take the Academy Award for Best Director. For what’s believed to be the first time, all five DGA nominees also wrote the screenplays for the movies that earned them Guild nods. Nolan penned a script for Dunkirk that was about half the length of what he normally would write for a feature. An economical 76 pages contained “mostly stage direction and very little dialogue,” he said. 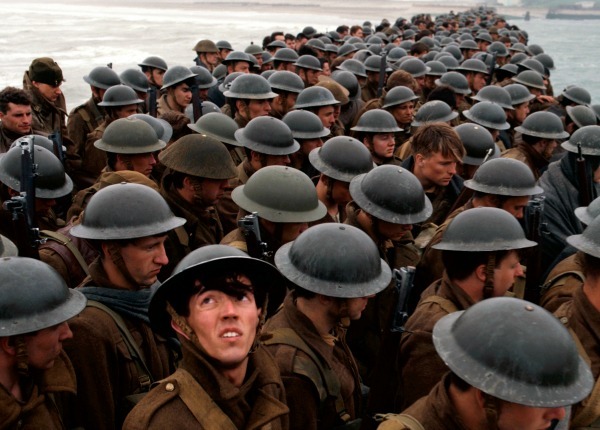 This also marked the first feature for Nolan depicting a true historical story, which necessitated him spending time up front in the actual filming locations, including Dunkirk beach. Prior to writing the screenplay he walked the locations, soaked them in, and researched the history extensively. Challenging himself in this manner spurred Nolan’s growth as a filmmaker, a maturation which paradoxically makes it increasingly difficult to come up with something he hasn’t yet experienced. However, Dunkirk fit the bill, extending him into different realms—a true story, and logistically dealing with boats and how to best capture the experience at sea on film. Casting also presented a different experience from what had been the star marquee actor norm for Nolan. For Dunkirk, he found himself instead looking for “unknowns in the leads,” portraying the 18 and 19-year olds who were in battle. As for what he sought on the acting front, Nolan said performers who could visually elicit “the mysterious quality of empathy.” He needed “a kid you need to care about,” someone an audience could relate to even though that character doesn’t talk a lot in the movie. Also in the mix was an accomplished actor, Mark Rylance, whom Nolan had wanted to work with for decades. Rylance portrayed Mr. Dawson, one of many civilian mariners whom the British navy enlisted to help rescue soldiers across the English Channel. Dawson was one of the everyday heroes who piloted his own boat to Dunkirk for the mission. Nolan credited Rylance with pointing out a gap in his script—namely the relationship Mr. Dawson had with his son who’s on board for the mission. Nolan and Rylance then collaborated to bring that aspect of the story to the screen, underscoring the importance, said the director, of listening to the professionals around you. While Nolan’s films are ambitious and often involve complex logistics that require extensive, detailed planning, he still likes to leave some room for the unexpected, happy accident that can occur during production. That’s why, he explained, that his preference is to do “as much in-camera as possible.” Computer-generated imagery, he pointed out, doesn’t typically have the flexibility to accommodate such serendipity. Immersing himself in the Dunkirk story which unfolded in 1940 proved to be a learning experience that went beyond just the event itself. It showed Nolan that like many people he had “an inadequate grasp of history and its importance.” He is now striving to address this, not so much as a filmmaker but personally to become a more informed person who better understands the past, its significance and the implications it carries relative to the present and the future. When presented with his nomination medallion at the evening DGA Awards ceremony, Nolan said that doing justice to history weighed heavily on him in the making of Dunkirk. He met several people who were part of that history first-hand, now in their 90s, and felt a profound responsibility to them to be true to their stories, honoring those who didn’t survive the event, as well as the heroism of both the civilian rescuers and those in the military service who lived to tell about it. As a first-time director, Jordan Peele described the audition process for actors “as much an audition for me working with actors. I learned I needed to experience the emotions as much as the performer did.” For Get Out auditions, Peele found himself at times teary-eyed, having cathartic moments with actors. “I didn’t know that would happen,” he shared. Budgetary limitations often fostered such “gifts” as reflected in a party scene where Peele would have liked 40 people in the background to create the desired vibe for the story. But Peele learned that instead he would have to make do with 16 or so backgrounders. This prompted him to place the performers in the scene in a choreographed fashion which wound up feeling “creepy” and “eerie,” promoting an uneasiness that wound up complementing his horror film. Waiting paid off—not just with the DGA nomination in the marquee category, but also with a DGA Award win for Outstanding Achievement of a First-Time Feature Film Director. As a writer and director, she likes to attain a story that is “something familiar but not what you could have imagined,” making it relatable for an audience but a new experience at the same time. Gerwig also likes when “the opening of a movie feels like the entire movie in a scene,” a reference to the mother-daughter exchange in the car between Laurie Metcalf as the mom and Saoirse Ronan as Lady Bird. Based on her experience as an actor, Gerwig finds herself innately “sympathetic” with performers, recalling the horror of auditioning. As a director, Gerwig said she’s not a fan of an actor sharing everything in one fell swoop during an audition. She prefers to get a sketch, “an opening gambit” that shows the promise of what a performer can offer. Gerwig saw that in Beanie Feldstein when she auditioned and won the part of Julie, Lady Bird’s best friend. At the audition, Gerwig recalled that she “knew right away” that Feldstein was right for the role. Once actors were cast for Lady Bird, Gerwig got them to meet, exchange phone numbers and get connected to one another. She likened this process to “laying sediment,” building a foundation for an ensemble cast to help foster a good working rapport which is conducive to their characters relating to each other. Gerwig said that directing is something she’s been “working towards and wanting to do for a very long time.” Lady Bird marks her first turn as a solo director (she had earlier co-directed Nights and Weekends with Joe Swanberg). For Gerwig, Lady Bird was like “realizing that you have the ability to breathe under water.” She related you may be apprehensive about diving into the ocean, thinking “what if I drown?...But what if you don’t?” Then you dive in, “and you don’t drown,” laughed Gerwig. Directing, she affirmed, has been a transformative experience. Producer Emilie Georges earned her first career Oscar nomination with Call Me by Your Name (Sony Pictures Classics) which is up for Best Picture—one of four nods, the others being for Best Adapted Screenplay (James Ivory), Leading Actor (Timothee Chalamet) and Original Song (Sufjan Stevens for “The Mystery of Love”). Georges shares the Best Picture nomination with producers Peter Spears and Marco Morabito, and producer/director Luca Guadagnino. Among the prime artistic challenges that Call Me by Your Name posed, observed Georges, was to do justice to the story, “the representation of the characters’ emotions and resilience, how to properly create the emotions of first love,” and to depict that love in the context of “giving life to a multilingual family, the fluidity between an American father (portrayed by Michael Stuhlberg), a French mother (Amira Casar) raised partially in Italy during the summers, and a son (Chalamet) who comes out of this trilingual environment,” discovering the beauty and heartbreak of love through a relationship with a visiting grad student (Armie Hammer). That world was set in 1983 in a 17th century villa where the characters spent the summer. Georges said that Guadagnino had an “obsession” for artistic coherence relative to the time period. As for what Georges’ first Oscar nomination means to her personally as well as professionally, she is “very proud” of the work, adding that it affirms her commitment as a producer “to continue to protect authors and directors who have strong visions, giving them the opportunity to act upon and realize their vision.” Georges finds it particularly gratifying to offer European directors a bridge to the U.S., being entrusted with bringing their talent to people throughout the world. Production designer Sarah Greenwood added two Oscar nominations to her filmography this year—for Beauty and the Beast (Disney) and Darkest Hour (Focus Features). She now has six career Academy Award nods; the first coming in 2006 for Pride & Prejudice. A common denominator across these half-dozen noms is that Greenwood earned them in collaboration with her long-time set decorator, Katie Spencer. With a track record together spanning some 20 years, Greenwood and Spencer first met at the BBC. Greenwood’s first collaboration with director Bill Condon, Beauty and the Beast appealed to the production designer on many levels. And then there’s the production designer’s dream of creating an 18th century village. Initially the plan was to shoot in France as Greenwood and her colleagues scouted there and found a number of viable options. Greenwood observed that Beauty and the Beast was the best of old Hollywood—physical construction, painting, designing and shaping—meshed with on-the-edge modern tech. While she worked with Condon for the first time, Greenwood has maintained an ongoing, long-time creative relationship with Darkest Hour director Joe Wright. Historical accuracy was essential, continued Greenwood, pointing out that Buckingham Palace back then was “aging, seemed a bit tawdry, a bit low key, a bit sad.” Greenwood and her colleagues built The House of Commons based on original drawings from that era, recreating what it looked like during Churchill’s war time reign as Prime Minister. Greenwood noted that enough can’t be said about Oldman’s incredible transformation into Churchill. Greenwood added that fortuitous timing has given us a movie season in which both Darkest Hour and Dunkirk were released. And she believes the two films “work brilliantly” to tell the story of Dunkirk from distinctly different yet fascinating perspectives. From the gray war room, Churchill in Darkest Hour put the wheels in motion for civilian mariners to take their boats across the English Channel to rescue the country’s trapped military forces. And in Dunkirk, we see that rescue come to life—the horrific deaths, along with an overlapping heroism and triumph of the human spirit depicted in both films. This is the 14th of a multi-part series with future installments of The Road To Oscar slated to run in the weekly SHOOT>e.dition, The SHOOT Dailies and on SHOOTonline.com. The series will appear weekly through the Academy Awards gala ceremony. The 90th Oscars will be held on Sunday, March 4, 2018, at the Dolby Theatre at Hollywood & Highland Center in Hollywood, and will be televised live on the ABC Television Network. The Oscars also will be televised live in more than 225 countries and territories worldwide.